There are a few things in my memory of this Hartford show. First was that the venue opened the house and, as the first of us entered, we were treated to Trevor Rabin and Alan and Chris finishing up a last-minute sound check. The story I got later from a friend who was backstage was they had arrived late. Which would explain Trevor scurrying offstage as the Civic Center began to fill up. There were also sound problems throughout. Random rings during Tony Kaye's bit on "Heart of the Sunrise"... The worst was late in the show (when sound men usually have it together): a low-end hum which was intermittently appearing during "Yours Is No Disgrace" became so loud just as Chris Squire began "Amazing Grace" that he cut it short. Instead of his typical Amazing Grace/Whitefish thing we got the first phrase of Amazing Grace (how sweet the sound) and then he waved at us with the free fingers on the fretboard of his bass, and he left the stage. There was a pause for a few minutes before they all returned to the stage and went into "And You And I". My backstage friend, who sold high-end guitars to the stars, also told me the Rabin and Anderson both had colds. I don't know if it was the cold medicine or what but "Roundabout" was done as an AM radio single version, sans the percussive bit ("Along the drifting clouds, the Eagle searching down on the land...") From my spot in the eighth row I saw the band looking to each other for the cues as they approached the change. Chris and Tony looked over, Alan gave the setup and Trevor... Trevor was upstage with his back to the audience looking at the ceiling. Jon's eyes widened in a moment of "Oh!" and the band went straight to the end of the song. Never missing a beat. Trevor came downstage looking a bit chagrinned. But what's a rock and roll show without a mishap? I wasn't familiar with YES before seeing this concert. Over the next few months I bought all of their tapes and within a year they were my favorite band. Despite this, I don't recall the show being especially good! I was disappointed not to hear either "Love Will Find a Way" or "Leave It," but what did I know back then? Obviously something from the show influenced me to buy all those tapes! Fifteen years later, YES is still my favorite band. I still like "Leave It" and "Love Will Find a Way," but my favorite albums predate this concert. As previously, Jon used the "We are the voice of every big generator" introduction (with vocoder-like effect on the phrase 'big generator') for "Big Generator", as well as referring to the Pleiaides ("Seven Sisters") star constellation as compelling him to write "Holy Lamb" (see audio transcriptions available for previous tour dates). Hmmm, I am fairly certain both "Yours Is No Disgrace" and "And You and I" were performed on this date. I remember rushing to grab my seat on the opening chords of the former (the opening tune after an intermission), and I remember Rabin's playing when the guitar kicks in for "Eclipse" for the latter. Notes: This is the only copy of this show, that I attended, that I have ever found. Unfortunately there are many spots that sound as though the taper is pulling the mike in and out of their pocket, making an over whelming scratching noise. There is a cut in the middle of Shoot High Aim Low and And You And I. The end of Wurm is cut, the entirety of Starship Trooper was not played. Love Will Find A Way is missing, or was not played. Rhythm of Love was performed in a different order than listed above. I have very fond memories of this show -- the first time I ever saw Yes. 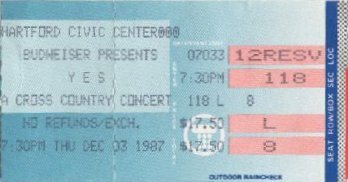 It was my senior year in high school, and the day tickets went on sale I cut out of school early to head to the local Ticketron outlet (unfortunately, not early enough to get great seats). My Grandmother played along with the excuse that I had a doctor's appointment, and picked me up at school that day - how cool is that?!? Jon, dressed all in white and holding some sort of staff, was his typical New Age self -- I remember exchanging puzzled glances with my friends as he rambled on about the Pleides star system in the intro to some song! All in all, a great memory from my youth. And should anyone doubt my status as a dedicated Yes fan, I had a major role in my school play the next night, and skipped out on dress rehearsal to see the show!